Torquay United captain Luke Young is likely to miss the whole of this season after injuring knee ligaments last month, says manager Paul Cox. Young, who got seven goals last season, was injured during training and had initially been ruled out of a return to action until February at the earliest. "For me, it's the season," Cox told BBC Radio Devon when asked how long Young would be out. "The best case scenario is six months, worst case scenario it'll be a year." 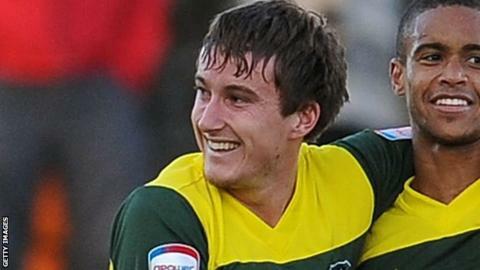 Young joined Torquay on a two-year deal last summer following his release by the club's League Two neighbours Plymouth Argyle. "I had a chat with Luke and as a person I'm totally gutted for the lad because he's been a shining example of what I want in a footballer at this football club," added Cox. "He's led by example, trained out of this world and when we played him in a more advanced role I thought he was looking like the player I'd heard a lot about. "But I personally believe he will come back fitter, stronger and a better player for it."